Flexing muscles, China kicked off military exercises in the disputed South China Sea, East Indian Ocean and West Pacific involving advanced warships, helicopters and "special warfare" soldiers. 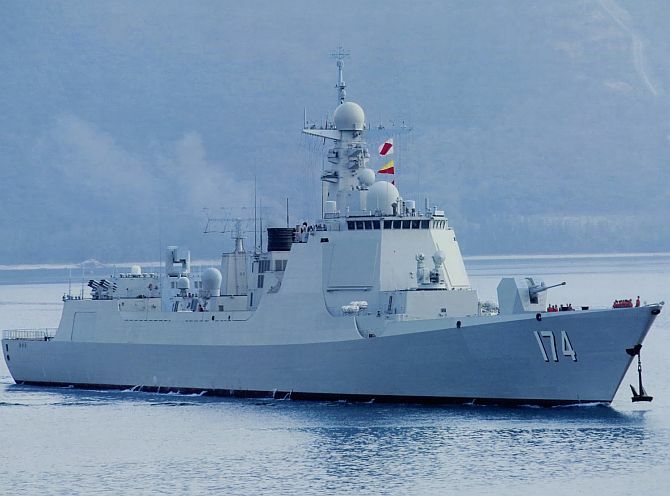 Three naval ships of China's Nanhai Fleet left a naval port in Sanya, Hainan Province on Wednesday, kicking off an annual combat drill in the South China Sea, East Indian Ocean and West Pacific, state-run Xinhua news agency reported. The three ships include missile destroyer Hefei, missile frigate Sanya and supply ship Honghu. They will later be joined by missile destroyers Lanzhou and Guangzhou, as well as missile frigate Yulin, which are now carrying out other duties. With three helicopters and dozens of "special warfare" soldiers, the fleet will be separated into three groups that will sail to areas of the South China Sea, the East Indian Ocean and the West Pacific, to conduct varied drills. The fleet will mobilize naval air force, garrison forces in the Xisha and Nansha islands, and forces of the Beihai Fleet along the way to take part in the drill. The drill aims to enhance combat readiness and practice coordination between ships and aircraft, and other forces, the navy said. China claims almost the whole of the South China Sea -- a major shipping lane rich in natural resources -- resulting in overlapping claims with several other Asian nations like Vietnam and the Philippines, Malaysia and Brunei. They accuse China of illegally reclaiming land in contested areas to create artificial islands with facilities for military use. Over half of the world's commercial shipping passes through the Indo-Pacific waterways, including one-third of the world's liquefied natural gas. Did Modi bow to China? Look, what China's navy is up to!